The hulking form of Uluru is a privilege to see, kicking back in the bath at Longitude 131° or whether standing in awe at its base. If there was ever going to be such a thing as an Academy Awards ceremony for bathtubs then this would be the winner hands down. It’s a bit about the design of the thing – it resembles a luxe rainwater tank – but it’s mostly about the outlook. It sits in front of a floor-to-ceiling window that perfectly frames the hulking form of Uluru in the distance. A front-row bathtub to one of the most breathtaking views in the world. Inside the luxurious new two-room Dune Pavilion (photo: Leigh-Ann Pow). I’m standing in the two-bedroom Dune Pavilion at Longitude 131°, the luxury desert basecamp nestled into the scrubby outback landscape of the Red Centre at Uluru-Kata Tjuta. This is a new inclusion to the property, installed during a $6 million renovation instigated by Baillie Lodges, owners of the celebrated Southern Ocean Lodge on South Australia’s Kangaroo Island and Capella Lodge on Lord Howe Island, who added the now 15-year-old property to its portfolio back in 2013. The building works, which shuttered the property for some four months, have managed to turn up the volume (all the way to 11) on what was already a world-class offering due to its exclusive proximity to the iconic hunk of sandstone that so captures our collective national imagination. Arriving into Ayers Rock Airport on a crisp, clear spring morning the day before, I caught fleeting glimpses of Uluru as the plane gently descended onto the red soil (well, the plane lands on a bitumen runway, but you get the idea), but this was just a prelude of things to come. 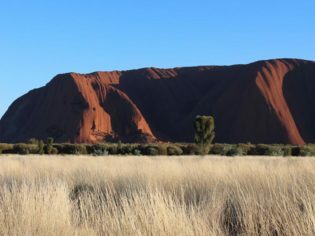 It is a short ride from the airport to Longitude 131°, part of the journey along a private road heading towards the property, which sits at the gateway to the Uluru-Kata Tjuta National Park. A full moon shines down on Field of Light Uluru (photo: Leigh-Ann Pow). Alighting from the car, the camp and its rock star view are largely hidden by a low dune of red earth. Following the path into the main lodge of the property, past a subtle front desk and smiling staff kitted out in a desert-ready wardrobe of R.M.Williams jeans, boots and shirts, and the help-yourself bar that can be indulged in at leisure, the space opens up to a cosy collection of lounges and tables set for lunch. And beyond that the view of the Rock itself. I gravitate to the outdoor desk to be just that little bit closer to it. As I sit feasting on a lunch of cold meats, cheeses and sandwiches, guests wander in from wherever it is they have been during the morning, out walking at the base of Uluru or making the most of the more immediate surroundings, including the lovely pool area. There are 15 luxury tents that make up the property, in addition to the Dune Pavilion. Each named after an explorer or pioneer who fearlessly set out to chart the true scope of the country, they naturally all have uninterrupted views out over the low desert scrub to Uluru beyond. Inside, all is appropriately luxurious; from the mammoth bed that looks out through a wall of windows, to the little things: home-made snacks in the mini-bar nook and good coffee. But it is the things that aren’t included that prove to be the ultimate luxury: no television and no radio. The sense of remove that even small considerations like this instils is absolutely thrilling: you are alone with your thoughts and the surroundings. Again it is impossible not to be drawn towards the view. Ironically no decks or balconies were included in the original design of the tents. But Baillie Lodges are experts at recognising a good thing when they see it – literally – and maximising its potential, so decks were retro-fitted during the renovation process: sitting in the open air listening to the bird song and the wind rustling through the scrub as you gaze into the distance (good coffee within reach) is transformative. Every aspect at Longitude 131° is maximised for its wow factor: dinner on my first night is taken atop a dune, where a luxurious deck space with cosy dining ‘pods’ that look out towards the outline of Kata Tjuta in the distance at sunset offers another spectacular option for guests. And when the golden haze of the day’s end has faded, the stars in the inky-black desert night sky take over, the night chill assuaged by hot water bottles and blankets. After a blissful night’s sleep – the silence is so thick you can almost touch it – it’s time to get up in the grill of the Rock itself. My guide Rick Peterman, a transplant to the Red Centre, has a staggering self-taught knowledge of Uluru and its surrounds, and during a 10-kilometre walk around its circumference he regales us with the stories of the Anangu people, the traditional owners of Uluru and Kata Tjuta, and name checks the plentiful desert wildflowers that add surprising pops of vivid colour to the scrub during the spring months. The landscape and its unforgiving nature is exhilarating and confronting all at once. It makes you feel like you could be the last person on Earth: Rick’s ex-army training and quiet confidence is reassuring. Returning to Longitude 131°, the newly installed Spa Kinara (which means ‘moon’) is the perfect antidote to walking weariness. Inspired by the design of the ‘wiltja’, the traditional shelter of the land’s Indigenous ancestors, treatments here make use of the desert’s plentiful resources of native beauty products, from Kakadu plum, quandong, irmangka-irmangka and desert lime to Australian yellow clay and nutrient-rich desert salts. As if trying to out ‘wow’ the previous night’s dining experience, this evening’s dinner will be a multi-course affair at Table 131°, a clearing in the desert blanketed by stars. But first, a trip to Field of Light Uluru by celebrated British artist Bruce Munro, an instalment of 50,000 coloured spindle lights that snake across a vast expanse of desert; the full moon that casts a haunting glow over the landscape makes the whole experience otherworldly. Arriving back at my room after dinner, I find the deck area warmed by a gas fire and a luxurious swag bed set up, complete with hot water bottles and a tray of treats: popcorn sprinkled with salt bush-infused salt and a trio of spirits to ward off the cool from the inside. If there was ever such a thing as Academy Awards for deck swags this would surely be the winner hands down. Getting there: Virgin Australia fly to Uluru daily from all capital cities. Staying there: Nightly rates at Longitude 131° start at $1500 per person twin share for a Luxury Tent, and $2900 per person twin share in the Dune Pavilion. This price includes all dining, open bar with Champagne, premium wines and spirits, in-suite bar, signature experiences and return Ayers Rock Airport transfers. Playing there: While a selection of Signature Experiences are included in a stay at Longitude 131°, a private expedition with your own guide can be booked to explore the protected cultural and natural landscape of Uluru-Kata Tjuta National Park on four signature experiences, starting from $2400. Bookings for Spa Kinara’s full range of treatments can be made before arrival or while in residence. The dune-top dining can also be booked as an extra.